Your first stop for a friendly and professional, guided walking tour of this wonderful city. of my birth. I would be delighted to show you around this beautiful city. history of this fascinating city. My 'Welcome to Bucharest' City Centre Tour lasts over the period of 3 hours, meeting at your centrally located hotel, or pre aranged meeting point. spectacular architecture and memories of the cold war and revoloution era... it will enthral sightseers of every age! Morning or afternoon booking is available and centrally located hotel meeting is free with all my tours. My popular 'Days of Communism Tour' (3 hours), concentrates on the modern history of the city centre, including Revolution Square and The Memorial of Rebirth, The Boulevard of Socialist Victory and relics from the Communist era, including the newly refurbished Unirii Fountains, and Constitution Square. Learn what it was really like to live under the rule of Communist dictator Nicolae Ceausescu and live through the revolution of Christmas 1989. Click to find out more..
My Old Centre Tour of Bucharest city centre (60 minutes), Visits the heart of Bucharest. Take a walk through the famous, ancient streets of Bucharest and hear the history of this great city. See the Princely Old Court, court of Vlad Tepes, the famous Manuc's Inn and St Anton Church. Stroll down Lipscani Street which is full of shops and restaurants and marvel at the eclectic mix of architectural styles which tells the story of Romania's beginnings and sometimes torrid history. My Mini Tour of Bucharest city centre (60 minutes), concentrates on University Square, Revolution Square, and the spectacular Romanian Athenaeum. 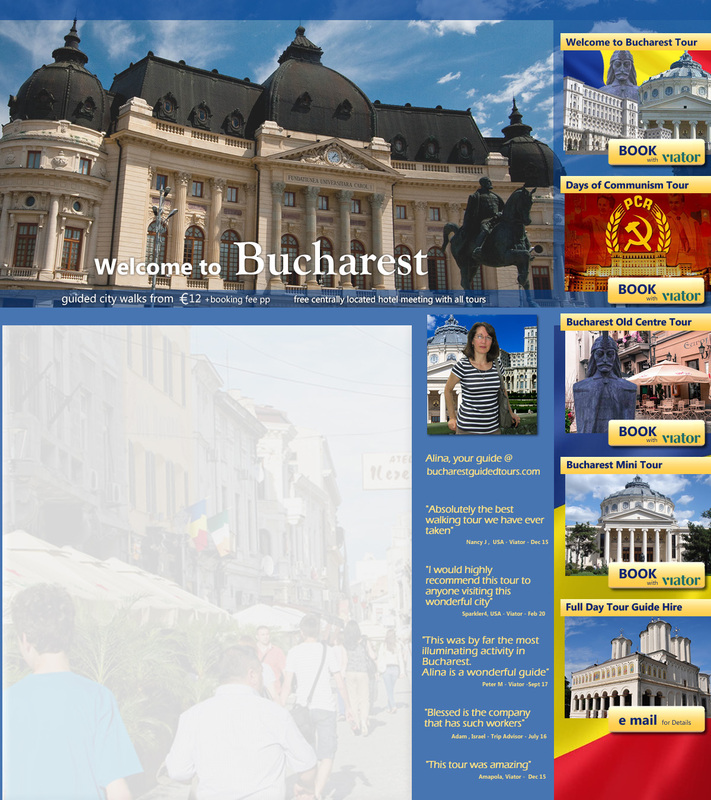 This tour is ideal for day visitors to Bucharest and can be booked for anytime during the day or early evening. If you have pre aranged a trip inside the famous Palace of Parliament- your tour can be tailored to finish outside the main entereance of Parliament at the desired time. Please e-mail for this addition to your tour. . If you wish to book with me or find out more about this friendly and professional service, please contact me at info@bucharestguidedtours.com, or call - 0040 742 600 164.